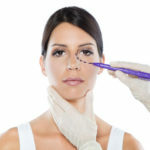 Nose surgery may be desired because the nose is too big or misshapen. In some patients, nose may have been injured and it may be difficult to breathe through the nose properly or as a result of a congenital abnormality such as cleft lip and palate causing dissatisfaction. Surgery is not normally considered until the nose is fully grown, that is from about 18 onwards. This procedure is specifically targeted at the soft tissues under the chin, extending a short way down the front of the neck and can be carried out as a Day Case, or combined with a Bilateral Minifacelift or with a Face/Necklift with a one or two night stay. A horizontal incision (cut) is made in the crease just under the skin (where it is well concealed). A crescent-shaped, area of skin, based on the horizontal incision, with its widest part pointing backwards down the neck, is then removed, together with all underlying fat, extending under the skin down the upper part of the front of the neck to remove further fat.